The Catiline Conspiracy and The Jugurthine War are the two separate surviving works of the historian commonly known as “Sallust”. Nearly contemporary to the events he describes, he is supposed to have been a retired officer of Caesar’s army. “Catiline” contains the history of the memorable year 63. Sallust describes Catiline as the deliberate foe of law, order and morality (although party politics may have influenced his view). Still, Sallust does recount Catiline’s noble traits, including his courage in the final battle. There is doubt among historians about whether Caesar was involved in the conspiracy; several of Catiline’s adherents who survived later joined Caesar’s side in his was against Pompey. The difficulty of Cicero’s position is thoroughly treated. 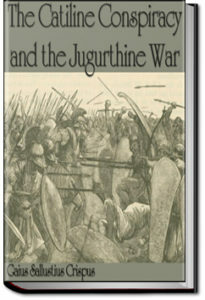 Jugurthine War records the war in Numidia c.112 BC. This war, which introduces the rivals Marius and Sulla to the Roman political scene, recounts the downfall and capture of the Numidian King Jugurtha. There is an exciting description of an agile Ligurian agent of the Roman side entering a besieged enemy city.